Issue 3 of SRSP-338.6 has been developed to reflect modifications made to RSS-191, Issue 2. The certification requirements for point-to-point broadband communication systems in the band 38.6-40.0 GHz have been removed from RSS-191, Issue 2 and transferred to SRSP-338.6, Issue 3. 1.1 This Standard Radio System Plan (SRSP) sets out the minimum technical requirements for the efficient use of the frequency band 38.6-40.0 GHz for digital systems in the fixed service for broadband wireless applications, including point-to-point and point-to-multipoint systems. 1.2 This SRSP is intended to be employed in the design and specification of radio systems and equipment, and in the technical evaluation of applications for new radio facilities or modifications to radio systems submitted in accordance with the current issue of Radio Standards Procedure, Application Procedures for Planned Radio Stations Above 960 MHz in the Fixed Service (RSP-113). 2.1 This SRSP replaces SRSP-338.6, Issue 2. Further revision of this SRSP will be made as required. 2.3 The arrangements for non-standard systems are outlined in General Information Related to Spectrum Utilization and Radio Systems Policies (SP-Gen). 2.4 Although a radio system may conform to the requirements of this SRSP, modifications may be required to the system whenever harmful interferenceFootnote 1 is caused. 2.5 When potential interference between radio systems cannot be resolved by the parties concerned, Industry Canada should be advised. After consultation with these parties, the Department will determine the necessary modifications and schedule of modifications to resolve the conflict. 2.7 It should be noted that the fixed terrestrial service shares this band with other services in accordance with the Canadian Table of Frequency Allocations and spectrum utilization policies. 2.8 It should be noted that an arrangement exists between Canada and the United States regarding power flux density levels produced by the fixed-satellite service (FSS) to protect the fixed service. See excerpt from Arrangement Between Canada and the United States on Principles to Govern the Use of the 37.5-42.5 GHz Band by the Fixed and Fixed-Satellite Services (Annex E). 2.9 The Department will require applicants and/or licensees to cooperate in the selection and use of the assigned frequencies in order to minimize interference, thereby obtaining the most effective use of the authorized spectrum. 2.10 For point-to-multipoint implementations operating in the band 38.6-40.0 GHz, the equipment must be type-approved in accordance with Radio Standards Specification, Local Multipoint Communication Systems in the Band 25.35-28.35 GHz; Point-to-Point and Point-to-Multipoint Broadband Communication Systems in the Bands 24.25-24.45 GHz and 25.05-25.25 GHz and Point-to-Multipoint Broadband Communications in the Band 38.6-40.0 GHz (RSS-191). 2.11 Licensees are required upon request to make available to Industry Canada information on certain technical parameters of their hub and point-to-point stations. 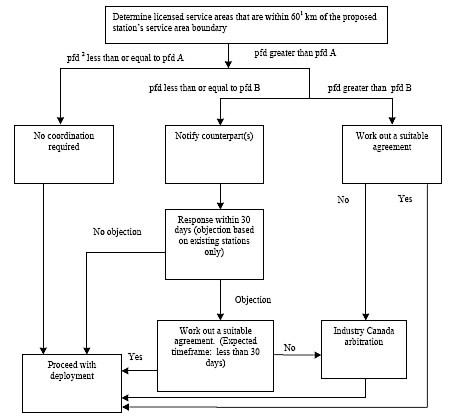 The current issues of the following documents are applicable and available on the Spectrum Management and Telecommunications website at http://www.ic.gc.ca/spectrum. 4.1 The band 38.6-40.0 GHz is divided into 14 (50 MHz + 50 MHz) paired frequency blocksFootnote 2, as shown in Table 1. 4.2 The frequency blocks available for licensing are symmetrically paired to facilitate frequency division duplex (FDD) systems. For these systems in Blocks C/C' to J/J', the base station to subscriber links are preferred in the upper frequency block, and the subscriber to base station links are preferred in the lower frequency block. Time division duplex (TDD) systems may operate in either sub-band. 4.3 The frequency blocks A/A', B/B', and K/K' to N/N' are licensed on a shared basis among several operators. Operators may deploy point-to-point systems in accordance with their spectrum licences. 4.4 The frequency blocks C/C' to J/J' are licensed on an area-exclusive basis. Operators may deploy point-to-point and/or point-to-multipoint systems within their spectrum licensed service areas. 5.1 Licensees are expected to take full advantage of interference mitigation techniques such as antenna discrimination, polarization, frequency offset, shielding, site selection, and/or power control to facilitate the coordination of systems. 5.2 If a licence is transferred, the sharing agreement(s) developed between the former licensees shall remain in effect until superseded by a new agreement between the licensees. 5.3 In the event that a satisfactory agreement or successful coordination between the licensees is not reached, the installing licensee should inform Industry Canada. In these cases, the Department may impose appropriate technical limitations to facilitate reasonable implementation of systems. Use of the band 38.6-40.0 GHz near the Canada/United States border is subject to the provisions of the Interim Arrangement Concerning the Sharing Between Canada and the United States of America on Broadband Wireless Systems in the Frequency Bands 24.25-24.45, 25.05-25.25 GHz, and 38.6-40.0 GHz. The following coordination procedures are intended to be used between two licensees in the absence of another mutually agreed upon standard to govern coordination of any proposed 38 GHz transmitter. Licensees who propose transmitters that would normally trigger the present procedure, but who can mutually agree to an alternate coordination procedure, are not bound by this process. If a proposed station triggers the coordination process, the installing licensee will be obligated to notify all licensees concerned. The said notice shall include the applicant's interference analysis and all data required for the recipients to perform an interference analysis (see Annex A for suggested parameters). It is recommended that prior to commencement of operation of a 38 GHz system, field tests be performed to determine whether interference caused by building reflections or unknown frequency sources, which was not anticipated during the interference calculationsFootnote 4, is detected at the proposed site while looking along the proposed azimuth. Upon receipt of a coordination notice, a recipient shall have a maximum of 10 business days to submit an interference objection. This objection shall include the calculation details of all potential cases of unacceptable interference into and from facilities proposed in the notice. Failure of a recipient to respond to a coordination notice within the 10 business day time frame will indicate that the recipient has no interference objection(s) to the facilities proposed in the notice. At times, it may become necessary for licensees to deploy systems even more rapidly than provided for in the notice and response procedure contained in this recommendation. To do so, licensees shall be allowed to activate systems immediately upon confirmation of receipt of the coordination notice, provided that the notice clearly identifies a licensee's intent to do so, and includes the activation date, the time, and a 24-hour contact telephone number for notification, should an interference case occur. Licensees activating facilities under this expedited procedure will be held wholly responsible for avoiding and/or resolving any cases of interference created by such activation, and will be required to cease transmission immediately upon receiving verbal and/or written notice from another licensee that interference has occurred. This requirement will remain in effect until the standard 10-day coordination period has expired. Upon successful resolution of all interference objections, the licensee shall so inform Industry Canada and have 90 days to construct and commence operation. Within two (2) business days of completion of construction and initiation of operation of coordinated facilities, a licensee will notify all licensees who received a coordination notice that facilities contained in that notice are in permanent operation. Upon decommission of previously operational facilities, a licensee shall notify all other affected parties that a particular facility has been permanently taken out of service within two (2) business days of decommission. Affected parties are defined as those who would have received a coordination notice under this recommendation had this been a proposed activation. Although coordination between adjacent block licensees operating in the same vicinity is not required in most cases, licensees may agree to coordinate certain installations to avoid interference. 8.1 Domestic coordination is required between licensed service areasFootnote 5 where the shortest distance between the respective service area boundaries is less than 60 kmFootnote 6. Operators are encouraged to arrive at mutually acceptable sharing agreements that would allow for the provision of service of each licensee within their service area to the maximum extent possible. 8.2.2 Deployment of facilities that generate a pfd less than or equal to -125 dBW/m2 in any 1 MHz (pfd A) at the other service area boundaries is not subject to any coordination requirements. 8.2.3.1 The operator must notify the respective licensee(s) of its intention to deploy the facility(ies), and submit the information necessary to conduct an interference analysis. 8.2.3.2 The recipient of the notification must respond within 30 calendar days to indicate any objection to the deployment. Objection may be based on harmful interference to existing systemsFootnote 7 only. 8.2.3.3 If there is no objection raised, the deployment may proceed. 8.2.3.4 If an objection is raised, the respective licensees must work in collaboration to develop a suitable agreement between the licensees before the deployment of facilities. The time frame to develop such an agreement should not exceed 30 calendar days. 8.2.3.5 Proposed facilities must be deployed within 120 calendar days of the conclusion of coordination, otherwise, coordination must be re-initiated as per section 8.2. 8.2.4 Deployment of facilities that generate a pfd greater than pfd B (-105 dBW/m2 in any 1 MHz) at the other service area boundaries is subject to successful coordination between the affected licensees. 8.2.5 The above process is described graphically in Annex C of this document. 8.3 Licensees shall ensure that the pfd at the boundary of the neighbouring service areas that have not been licensed does not exceed pfd B. 8.4 All results of analysis on pfd and agreements made between licensees must be retained by the licensees and made available to Industry Canada upon request. 8.5 Although coordination between adjacent block licensees operating in the same vicinity is not required in most cases, licensees may agree to coordinate certain installations to avoid interference. The maximum e.i.r.p. of a transmit station must not exceed +55 dBW per carrier. A = 11 + 40(foffset/Bocc ) dB, for emissions in which the occupied bandwidth is less than 1 MHz. Attenuation greater than 56 + 10 log10 (Bocc) dB, or to an absolute level lower than -43 dBW/MHz, whichever is less stringent, is not required. foffset: frequency offset from the virtual block edge in MHz. A = 43 + 10 log10 (Pmean) in dB, or 80 dB below Pmean, whichever is less stringent. Pmean is the mean output power of the transmitter in watts. For a multi-carrier transmitter or multi-transmitters sharing a common final stage amplifier, the emission mask is to be the same as for single-carrier transmitters, but using the occupied bandwidth that is defined for multi-carrier transmitters. The total mean power shall be the sum of the individual carrier/transmitter powers. Guard bands, if used in the equipment design, shall also be used in testing the spectrum mask. When several transmitters share a passive antenna, each transmitter should satisfy the individual mask; the multi-carrier mask should not be applied in this case. For point-to-point blocks A/A', B/B', and K/K' to N/N', the co-polarized radiation pattern envelope in the horizontal plane of the antenna must remain within the envelope shown in Figure 1 for both vertical and horizontal polarizations. For point-to-multipoint systems, the e.i.r.p. density shall not exceed +30 dBW/MHz for subscriber stations, and +14 dBW/MHz for hubs. Definition of Tier 3 areas can be found on Industry Canada's Spectrum Management and Telecommunications website at http://www.ic.gc.ca/spectrum. 1. In the event an operator using sites of very high elevations relative to local terrain that could produce interference to service areas beyond 60 km, this operator shall coordinate with the affected licensee(s). 2. Pfd is calculated at the service area boundary of the respective counterpart(s). recognize that these principles are subject to review at any time at the request of administrations party to this arrangement. Return to footnote reference 1 For the purpose of this SRSP, "harmful interference" means interference that endangers the functioning of a radionavigation service or of other safety services, or seriously degrades, obstructs, or repeatedly interrupts a radiocommunication service operating in accordance with regulations and technical requirements laid down by Industry Canada under the Radiocommunication Act. Return to footnote reference 2 For the purpose of this SRSP, a frequency block is defined as a contiguous portion of spectrum within a frequency band, typically assigned to a single operator. A frequency block may accommodate one or more channels. A channel is defined as a specified portion of the radio frequency spectrum that carries a specific radio signal. Return to footnote reference 3 For this coordination procedure, radio system "B" requires coordination with radio system "A" if there is any significant overlap of the interior spectrum skirts (i.e., both co-channel and adjacent channel, regardless of their occupied bandwidth). Return to footnote reference 4 Calculations can be made with the help of Bulletin TSB10-F, Interference Criteria for Microwave Systems, available from the Telecommunications Industry Association (TIA), or other recognized coordination methodology and criteria. Return to footnote reference 5 Annex B is provided as a guide to determine which service areas should be considered for coordination. Return to footnote reference 6 In the event that an operator uses sites of very high elevations relative to local terrain that could produce interference to service areas beyond 60 km, the operator shall coordinate with the affected licensee(s). Return to footnote reference 7 Existing systems include systems that are operational prior to the receipt of notification, or systems that have previously been successfully coordinated. Return to footnote reference 8 Virtual block edge is a reference frequency used as a block edge frequency for testing of unwanted emissions to avoid effects of radiow frequency (RF) block filters. See RSS-191, Section 4.5 for more details. Return to footnote reference 9 Technical requirements related to the certification of point-to-multipoint frequency blocks C/C' to J/J' are specified in RSS-191. Return to footnote reference 10 It should be noted that the example calculation assumes line-of-sight conditions. Where line-of-sight does not exist, an appropriate propagation model that takes the non-line-of-sight situation into account should be used. This figure shows the coordination footprint for co-channel frequency coordination. 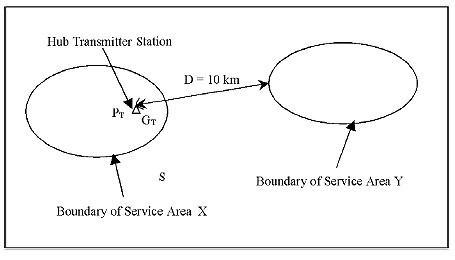 Coordination is required with all stations within a distance of 56 km where the off-axis angle at the new station’s bore-site is less than or equal to 5 degrees. Coordination is required to a distance of 32 km where the off-axis angle is greater than 5 degrees and less than or equal to 10 degrees. At off-axis angles greater than 10 degrees, coordination is required within a distance of 8 km. Line Graph: Shows the antenna radiation pattern limits in dB down from the main lobe for azimuth separations from the main lobe between 0 and 180 degrees. The y-axis measures antenna directivity in dB down from main lobe from -60 to 0. The x-axis plots azimuth in degrees from main lobe from 0 to 180. There is one plot line which ranges from -55 to 0 on the y-axis. Data points on the plot line include: 0 dB from 0 to 5 degrees, -23 from 5 to 10 degrees, -29 dB from 10 to 15 degrees, -33 dB from 15 to 20 degrees, -26 dB from 20 to 30 degrees, -42 dB from 30 to 100 degrees, -55 dB from 100 to 180 degrees. 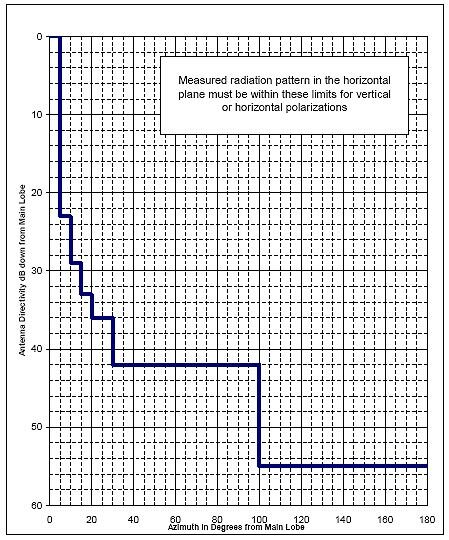 Measured radiation pattern in the horizontal plane must be within these limits for vertical or horizontal polarizations. This figure provides a flowchart to illustrate the domestic inter-system coordination process for point-to-point and point-to multipoint frequency blocks C/C' to J/J'. This process is fully described in Section 8.